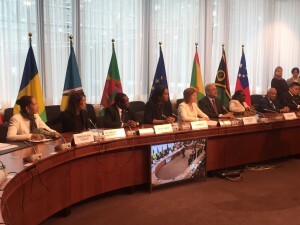 Roseau, Dominica – Tuesday, June 2, 2015 – On May 28, 2015 Dominica’s Minister of Foreign Affairs & CARICOM Affairs, Honourable Francine Baron signed the Schengen visa waiver Agreements with the European Union in the margins of the 40th ACP-EU Council of Ministers meeting in Brussels. This significant step in the relationship between the Eastern Caribbean and the EU and its Member States signals a renewed step toward greater people to people contact, travel to initiate greater trade and investment flows as well as increased tourism between both regions. Honourable Francine Baron expressed gratitude on behalf of the Government and people of Dominica for this milestone and noted that the freer travel between both regions is a “significant development as it reflects the confidence and comfort that the EU has in Dominica.” She further highlighted that visa free travel was illustrative of a strong and vibrant relationship between Dominica, the OECS region and the EU. The signing of this agreement introduces visa free access to the Schengen area, which comprises all EU Member States except the United Kingdom and Ireland. The agreement allows for travel to the following EU member states: Austria, Belgium, Croatia, Czech Republic, Denmark, Estonia, Finland, France, Germany, Greece, Hungary, Italy, Latvia, Lithuania, Luxembourg, Malta, Netherlands, Poland, Portugal, Slovakia, Slovenia, Spain and Sweden. The Agreement makes provision for visa free travel for citizens of Dominica holding a valid ordinary, diplomatic, service, or official passport travelling to the European Union Schengen States for a maximum period of 90 days in any 180-day period. Citizens of the European Union are also able to visit Dominica visa free for a maximum of up to six (6) months. Persons travelling to carry out paid activity during their short stay are not covered by this agreement and laws regarding access to employment will continue to apply. It must be noted that while the agreement is in place for France and the Netherlands, it does not apply to French and Dutch Overseas Territories. Separate Agreements must be also be signed with non-EU Schengen States such as Switzerland, Lichtenstein, Iceland and Norway as this visa waiver agreement does not apply to them. The Schengen visa Agreements came into effect as of May 28, 2015, this means that visa free travel to the EU Schengen states will took effect immediately as of that date.